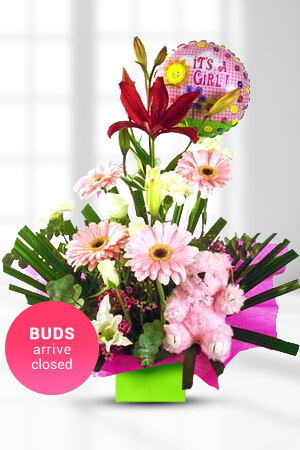 For the new mum with a beautiful baby girl, this boxed arrangement with girlie pink Gerberas and bud Roses, creamy white Oriental Lilies, gorgeous Carnations, and splendid Asiatic Lilies, and much more is a great way to say congratulations. 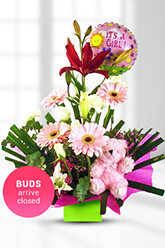 Complete with a cuddly pink teddy and a small "It's a girl" balloon, it says it all!Lilies may be sent closed/partially closed in order to prevent damage and to last longer.For a lasting impression and the ultimate congratulations, we suggest a bottle of Moet and Chandon to complete this already stunning gift. Website is user friendly and I love how you have tracking available on your orders. Great prompt service. The flowers were lovely she was surprised and delighted. The flowers were lovely and Kerri-Anne was surprised and delighted with them. Wonderful; so easy to order and the flowers were delivered as promised and were beautiful! Excellent service ?? Same day delivery to Alice Springs Hospital was excellent. Easy to order online. Delivery made on the requested day. Recipient said flowers were lovely.